While the majority of critics cruising the Croisette continue to debate the pros and cons of the Netflix distribution model, here I am mourning the fact that a lack of theatrical release will likely mean I won’t be able to treat myself to a plush “Super Pig” toy come Christmas time. For there is no doubt that the star of Bong Joon Ho’s gonzo creature feature is its eponymous porker. She’s the size of a hippo with the sensibility of a beloved pet pooch, and brought to life through pristine digital effects. Sure, this large piggy might not be able to fly, but she has a spirit that will make your heart soar. In the eyes of young Mija (Ahn Seo-Hyun), Okja is a cherished companion. Having been brought up by her gracious grandfather (Byun Hee-bong) on a remote mountain top in the South Korean countryside, this sweet, super-sized swine has become more than a friend, she’s family; the pair of them bounding around the georgic landscapes during the film’s stronger first half with a carefree enthusiasm that gives prominence to the compassionate bond they share. 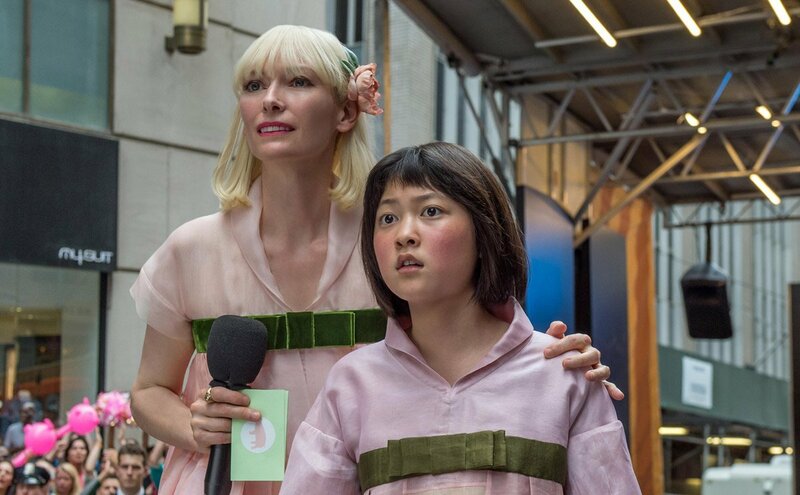 In the eyes of the family-owned, food-tech conglomerate run by Lucy Mirando (Tilda Swinton) though, Okja is nothing more than a financial commodity. As Joon Ho reveals during the punchy prologue, the Mirando Corporation modified Okja and a number of other “Super Pigs” in a lab 10 years ago, and sent them away to the farthest corners of the world, monitoring them regularly until the time came when they could be sent off to slaughter and be turned into any number of tasty meat treats. Sadly for Mija that time has now come, and isn’t long before we’re seeing Okja dragged away by Mirando Corp’s resident celeb vet Johnny Wilcox (Jake Gyllenhaal) for a whistle stop media tour in the US, followed, inevitably, by a fatal trip to the company’s abattoir. Desperate to try and save her best friend’s life, Mija soon sets off in pursuit. Joon Ho’s style of storytelling here shares a distinguished tonal harmony with the work of author Roald Dahl; blending the comical & curious with the macabre. Helping Mija on her mission is a group of animal rights activists led by a magnificently mystifying Paul Dano, and when the action eventually touches down in New York, we’re led through a number of harrowing sequences that see Okja suffering at the hands of Wilcox in a underground test lab. Where the film fails, however, is in its inability to bring these ingredients together into a truly satisfying whole. Joon Ho directs with a grinning playfulness, and there are a number of giddy set pieces to indulge in, including a chase through the Seoul subway that’s scored to ‘Annie’s Song’. But he’s never able to find a proper focus in the script he co-wrote with Jon Ronson – the baleful intensity of the aggressively anti-capitalist second half sitting uncomfortably next to the buoyant, free-spirited energy of the first – and as such what we’re left with is an inflated monster mash that’s packed with more gristle than meat. Some overripe posturing from the wider ensemble troubles the recipe further: Swinton’s overwrought CEO is too strained to be sinister, while Gyllenhaal’s role as an overblown egotist simply left one wondering what could have creatively propelled the actor to channel Dave Sheridan’s Doofy from Scary Movie. Thankfully, Seo-Hyun’s beautifully refined performance as Mija is more than enough to hold our attention; her strength and emotional vulnerability perfectly poised against each other. Those opening scenes of her tearing through the forest with Okja echoing the rich wonder and escape of Ghibli’s My Neighbour Totoro. Although perhaps, when considered as a whole, Okja shares a more similar flavour with David Lowery’s remake of Pete’s Dragon. The chief difference being that Joon Ho has decided to serve up his dish with a thick slice of ham. Film journalist and blogger with a tendency to buy more DVDs than I know what to do with, a hearty willingness to watch anything, a guilty love for action films starring Arnold Schwarzenegger, and a burning hatred of anyone who dismisses a film before they've seen it!